The nervous system can be divided into the cerebrospinaland autonmic systems. The nervous system can be divided into the cerebrospinaland autonmic systems. The cerebrospinal system is composed of the central nervous system and the peripheral nervous system. The central nervous system is further subdividedinto the brain and the spinal cord (Healey 1957;Bernstein 1970; Northcutt & Davis 1983). Theperipheral system is composed of the cranial and spinal nerves and the associated sense organs (vision, smell, hearing, lateral is system, touch, taste, and electrical and temperature detection;). The autonomic nervous system is composed of sympathetic and parasympathetic ganglia and fibers. Fish brains are on average only 1/15 the size of the brain of a bird or mammal of equal body size. Sharks have much larger brains relative to body size than teleost`s and pelagic sharks have larger brains than pelagic teleost`s (Linsey &Collins 2006). In pickerels (Esox), the brain is only 1/1305 of body weight. Elephant fishes (Mormyridae) have the largest brains among fishes, 1/52 to 1/82 of body weight. This large brain is associated with electroreception, as we shall see later. In the Ocean Sunfish (Mola mola), the spinal cord is even shorter than the brain: a 1.5 ton fish, 2.5 mlong, has a spinal cord only 15 mm long. The brain can be divided into five parts from anterior to posterior (Fig. 4.11). The most anterior part is the telencephalon, or forebrain, which becomes the cerebrum oftetrapods. Its function in fishes is primarily associated with reception and passage of olfactory stimuli. The olfactory nerve (cranial nerve I) runs from the nostrils to the olfactory lobe of the brain. The olfactory lobe is large in hagfishes and lampreys, huge in sharks such as the hammerheads(Sphyrnidae), and moderately large in teleost’s such as catfishes that rely heavily on odors when foraging(Fig. 4.11E). 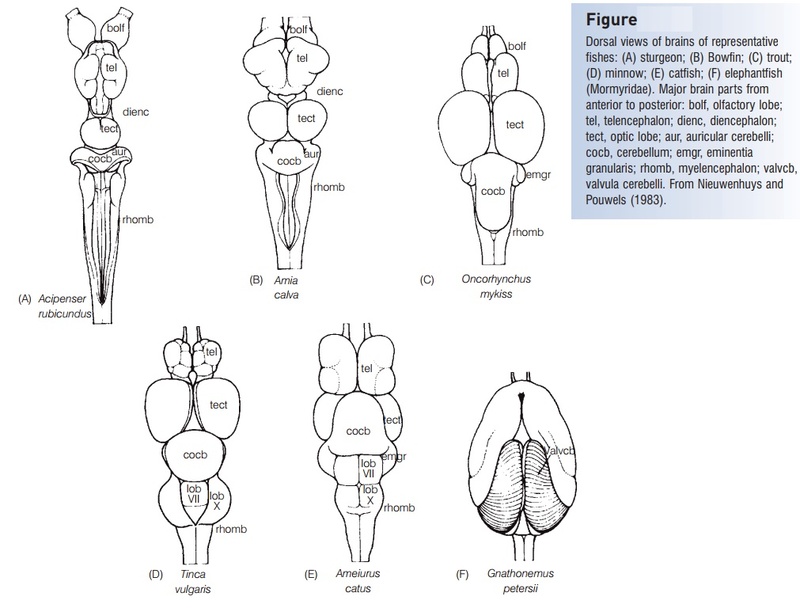 Dorsal views of brains of representative fishes: (A) sturgeon; (B) Bowfin; (C) trout;(D) minnow; (E) catfish; (F) elephant fish(Mormyridae). Major brain parts from anterior to posterior: bolf, olfactory lobe;tel, telencephalon; dienc, diencephalon;tect, optic lobe; aur, auricular cerebelli;cocb, cerebellum; emgr, eminentiagranularis; rhomb, myelencephalon; valvcb,valvula cerebelli. From Nieuwenhuys andPouwels (1983). The diencephalon, or ‘tween brain, lies between the forebrain and the midbrain and is also known as the saccusdorsalis. It functions as a correlation center for incoming and outgoing messages regarding homeostasis and the endocrine system. The pineal body is a hollow, invaginated,well-vascularized structure dorsal to the diencephalon and connected to it by a narrow hollow stalk. It frequentlynderlies a more or less unpigmented area of the cranial roof and is light-sensitive in some if not all fishes. Pineal functions are diverse, including light detection, circadian and seasonal clock dynamics, and color change. The pineal contains neurosensory cells that resemble cones in the retina. Photosensitivity of the pineal has been demonstrated by behavioral tests in Rainbow Trout. Light sensitivity ofthe pineal may allow it to play a navigation role in the cross-ocean migrations of large tunas such as the Atlantic Bluefin, Thunnus thynnus (Rivas 1954; Holmgren 1958;Murphy 1971). The pineal may regulate color change associated with background matching. It also produces an apocrinesecretion containing glycogen. There is a possibility that the pineal may also play an endocrine role, in that it produces the hormone melatonin, implying a potential pineal–pituitary relationship. The mesencephalon, or midbrain, is important in vision. The optic nerve (cranial nerve II) brings impulses from theeyes and enters the brain here. The midbrain is also a correlation center for messages coming from other sensory receptors. Fishes have two optic lobes, which are relatively large in sight-feeding species such as trout’s and minnows(Fig. 4.11C, D). The metencephalon, or hindbrain, functions in maintaining muscular tone and equilibrium in swimming. Thecerebellum, a large single lobe, is the largest component ofthe fish brain. Cranial nerve IV (trochlear) runs from themetencephalon to the eye muscles. The metencephalon is small in lampreys (Petromyzontidae) and almost absent in hagfishes (Myxinidae). In elephant fishes (Mormyridae), the cerebellum is hypertrophied to form the valvula cerebelli(Fig. 4.11F), which extend over the dorsal surface of the telencephalon. This large cerebellum is related to reception of electrical impulses. The myelencephalon, brainstem, or medulla oblongata is the posterior portion of the brain and the enlarged anteriorpart of the spinal cord. Cranial nerves V through Xarise here. The myelencephalon serves as the relay station for all the sensory systems except smell (cranial nerve I)and sight (cranial nerve II). It contains centers that control certain somatic and visceral functions. In bony fishes, it also contains respiratory and osmoregulatory centers. A series of investigators have correlated brain morphology with ecology and behavior: H. M. Evans (1940) studied European freshwater species, H. E. Evans (1952) investigated four species of American minnows (Cyprinidae), andR. J. Miller and H. E. Evans (1965) studied the brains of suckers (Catostomidae). The 10 cranial nerves in fishes are similar to those in other vertebrates. Cranial nerve I, the olfactory nerve, is a sensory nerve that runs from the olfactory bulb to the olfactory lobes. The optic nerve (cranial nerve II) runs from the retina to the optic lobes. As in other vertebrates, cranial nerves III (oculomotor), IV (trochlear), and VI(abducens) are somatic motor nerves that innervate the six striated muscles of the eye: IV, the superior oblique; VI, the external rectus; and III, the other four eye muscles. Unlike in most other vertebrates, four cranial nerves (VI through X) innervate parts of the lateral line system. The trigeminal, V, is a mixed somatic sensory and motor nerve serving the anterior portion of the head. Cranial nerve VII, the facial, and VIII, the acoustic, usually join to form theacousticofacialis nerve, which then subdivides into four groups of mixed nerves serving the temporal and branchial regions of the head. Patterns of nerves, such asthma of the ramus lateral is accessorius of the facial nerve(which innervates taste buds on the posterior head and body), have proved to be useful in assessing relationships ofteleost`s (Freihofer 1963). The glossopharyngeal, IX, isa mixed nerve that supplies the gill region. It often fuses with cranial nerve X, the anterior ramus of the vagus. The vagus is a mixed nerve connected to the body lateral line and viscera.